Sometimes in life you have to use the wrong tool to get the job done. Recently I had to use Apple’s Keynote to make documents containing a lot of graphic artefacts. Being a presentation tool, Keynote has no concept of generating an index of its contents, but from a user’s perspective a table of contents (TOC) is pretty much essential. Here’s a hack, using AppleScript, to make one. And it is a hack: it relies on the presenter’s notes fields being populated with whatever you want to appear in the TOC. This means that prior to running the script, someone needs to ensure that the correct information is held in the notes. 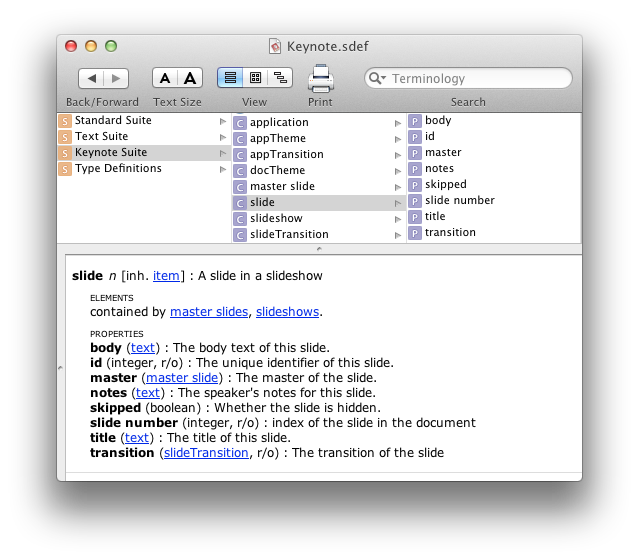 The Keynote dictionary only exposes a few properties to AppleScript. Of these one could use title or even body but I used notes because, well, it was all an afterthought. 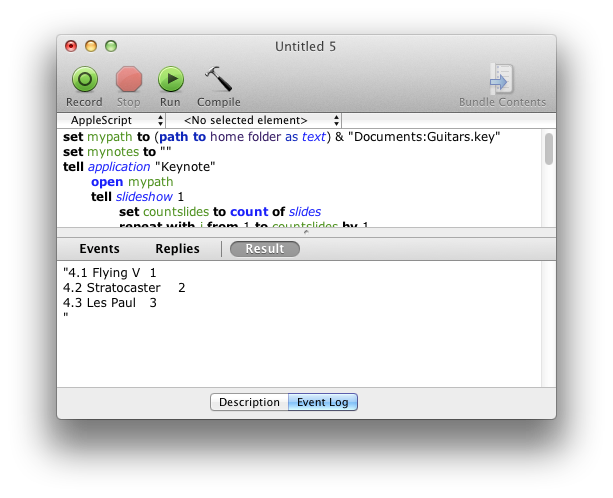 To generate the TOC, paste the following script into AppleScript Editor and edit mypath to point to your Keynote file. 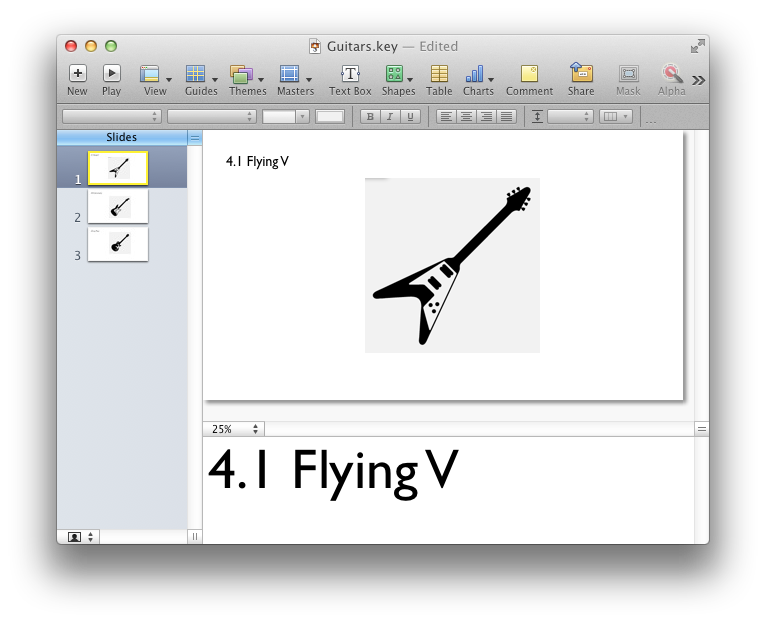 set mypath to (path to home folder as text) & "Documents:Guitars.key"
set mynotes to mynotes & notes of slide i & "\t" & i & "\n"
And then it’s simply a case of copying, pasting and formatting however you wish. Pasting into Keynote via Numbers, for example, will insert the TOC as a two-column table. Disclaimer: I’m an AppleScript newbie so what’s in the script may not be best practice. But I’ve been learning from the great resource that is MacScripter. Check it out for more info. Edit: As noted above it’s possible to read the title and body properties of a slide using AppleScript. In the default Keynote slide (see below), the upper box is title and the lower body. To target these, replace “notes” in the script with “title” or “body” as appropriate. This entry was posted in AppleScript, Development and tagged applescript, keynote, table of contents, toc by Stuart. Bookmark the permalink. Unfortunately this no longer works in Keynote 6. In this version notes are not an accessible attribute. This script would be even more useful if it could wrap each line in the table of contents with a link to the slide. 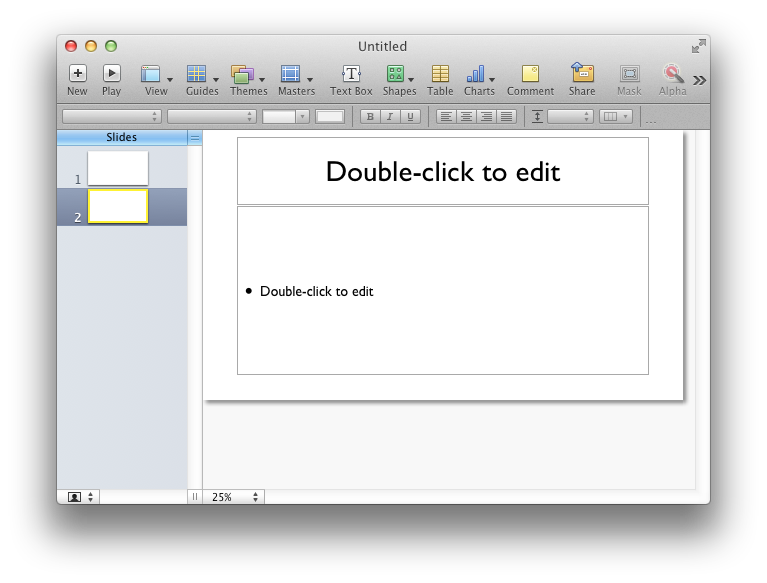 For example “Slide 1” would link to Slide 01 so it can be used to navigate the presentation. I’ve done some digging but cannot find out how to create hyperlinks programmatically. It’s easy enough to create a new slide and put the TOC on it, but I think you’re stuck with then manually selecting each item and doing Insert > Text Hyperlink. Your script was really useful, that was until I upgraded Keynote (no on 6.5.2). I’m afraid, even with the modifications you suggested above, I still can’t get it to work.